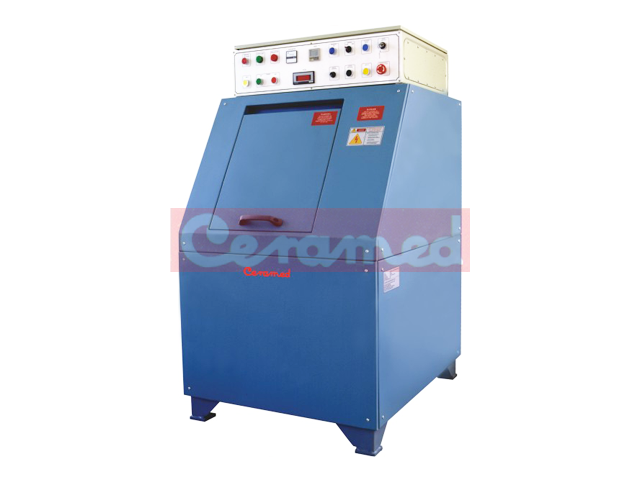 Centrifugal High Energy Finishing Machine is manufactured to meet the most rigid standards as demanded by specific industrial requirements of high volume and high surface finish. The machine generates a very high centrifugal force for extremely low process times. 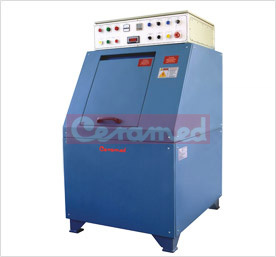 The machine is fitted with 4 hexagonal barrels with replaceable polyurethane lining. Sizes up to a maximum of 240 liter capacity are available with complete automated unloading mechanism. Direct drive system ensures trouble free performance as compared to conventional mechanism. Polyurethane liners/inserts can be easily replaced as they are removable type. Interlock facility is provided for door opening and automatic pressure release system to ensure operator safety. Stainless steel vibratory separator is provided for parts separation. Very simple and easy method for belt tightening. User friendly method of pressure releasing. © 2019 Ceramed. All rights reserved.